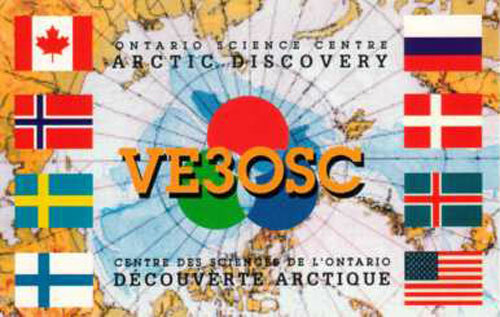 Here are a few QSL cards from amateur radio station VE3OSC at the Ontario Science Centre in Toronto. 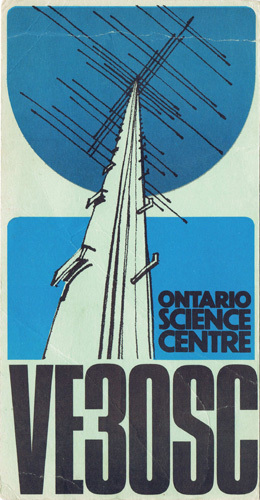 A 1969 VE3OSC QSL card shows the Big Bertha antenna array. 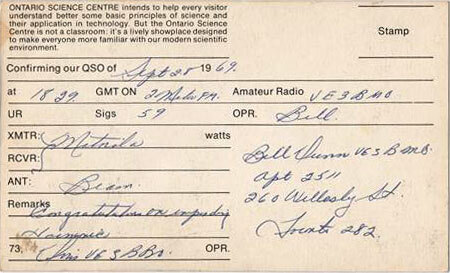 A 1969 VE3OSC QSL card confirming a local Toronto contact via 2m FM. An early VE3OSC QSL card shows the Big Bertha antenna array. 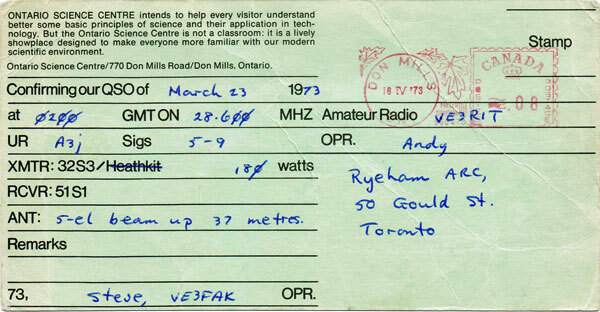 The reverse side of the 1973 QSL card from VE3OSC Toronto. The information above shows that the operator at VE3OSC was ‘Steve’ VE3FAK. The station contacted was VE3RIT, which was the club station at Ryerson Institute of Technology a few kilometres away. 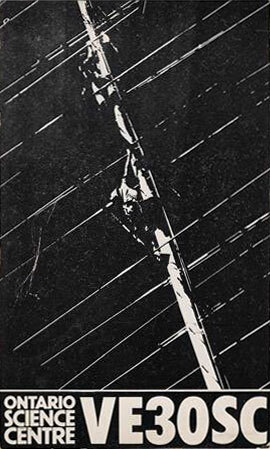 The contact was made using the Collins equipment (32S-3 transmitter) operating at 180 watts (this was the DC input power, rather than the output as would be commonly cited today). The antenna was the 5-element monoband yagi on the Telrex Big Bertha at an impressive 37m above ground. The contact was on the 10m band (28.600 MHz) using single sideband (A3j). The card also indicates that the station included Heathkit equipment. Does anyone have information about this? 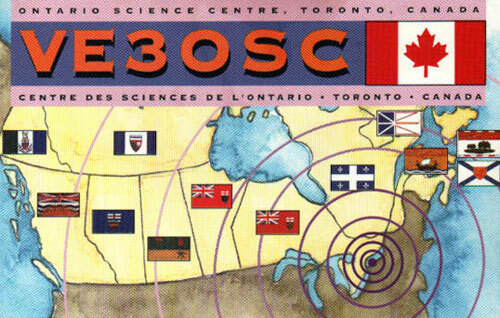 A 1974 QSL card from amateur radio station VE3OSC in Toronto. 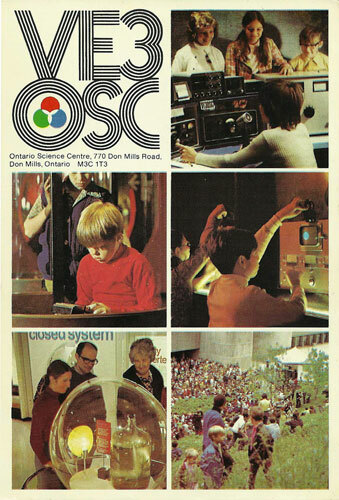 The card above was given to Josue Ascano VE3LHY when he visited the Ontario Science Centre in December 1974. The card shows the original Collins radio equipment, in an updated layout, and with a homebrew linear amplifier which replaced the original Collins 30S-1 amp. Interestingly, the hand-written note on the back of the card indicates that VE3OSC was using a Drake TR-4 transceiver at the time. Does anyone have any information about that? 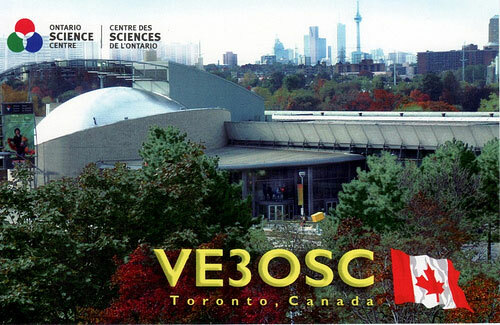 A QSL card from amateur radio station VE3OSC Toronto after the Ontario Science Centre added a French name.